San Jose is the most ideal base destination from which to take weekend trips in Costa Rica. It is centrally located and it’s an easy drive to both coasts. The Central Valley surrounding San Jose is also an incredible place to explore. Both Nature Air and Sansa operate out of San Jose, so jumping around the country is fast and affordable on one of their small planes. A weekend trip to Jaco is a popular choice for locals living in San Jose. The drive to Jaco is only an hour and 40 minutes and it’s a pretty straight shot down to the coast from the valley. The Jaco area is well known for its waves, sports fishing, happening nightlife, and luxury accommodation, especially in Los Suenos. There are multiple beaches around Jaco (Playa Hermosa, Playa Blanca, and Playa Esterillos) for those looking to get away from the weekend crowds. Don’t forget to stop at the famous Tarcoles River bridge on your way to Jaco to see the biggest congregation of crocodiles in Costa Rica. La Paz Waterfall Gardens and Peace Lodge has it all: an amazing lodge, five waterfalls, hiking trails, a butterfly observatory, a hummingbird garden, a jungle cat sanctuary, a toucan rescue exhibit and aviary, a monkey sanctuary, a serpentarium, a frog exhibit, an authentic Costa Rican farmhouse, and a trout lake for fishing. This spectacular place is a one-stop shop for observing some of Costa Rica’s most iconic plants and animals, learning about Costa Rican culture and traditions, and relaxing in a cozy lodge surrounded by astonishing beauty and nature. From San Jose, you can explore four of Costa Rica’s famous volcanoes with ease. Turrialba, Poas, Barca, and Irazu are all within an easy weekend trip distance, or even a day trip, away from San Jose. The Arenal Volcano is only three hours and 20 minutes away, too. The Central Valley is definitely a place where you can marvel at Mother Earth in all her glory. The volcanoes are all located within diverse and nature-rich national parks, too, which is an added bonus. Before you go explore the Poas Volcano, do check to make sure the park is open. Due to volcanic activity it has recently been closed to the public. The Pacuare River is one of the top rivers for white-water rafting in Costa Rica and has been rated as one of the top five rivers for rafting in the world by National Geographic. There are 52 rapids on this river and plenty of class III and class IV rapids to get your heart pumping. A two-day white-water rafting adventure is an exhilarating experience and perfect for those who love adventure. On top of cruising down the rapids, you will also have a chance to hike and observe unique plant and animal species along the way. Sarchi is an adorable little town about an hour outside of San Jose. It is famous for its oxcart art, a proud Costa Rican art form and tradition. Sarchi is also home to a wonderful array of artisans and small shops. If you are looking for some handmade goods to bring back home with you, this is the spot. Exploring the smaller towns in the Central Valley is a lovely way to have an authentic cultural experience in Costa Rica. There is also a butterfly garden and a botanical garden that you can visit here. Other beautiful towns in the Central Valley that are worth checking out include Grecia, Zacero, and Orotina. Just two hours north of San Jose is Sarapiqui. 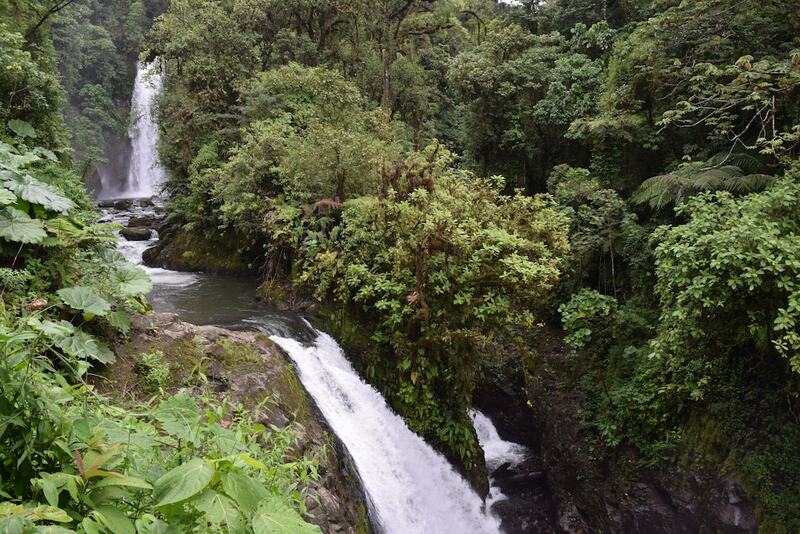 This lush rainforest region is home to an impressive variety of plants and animals. There are multiple tours and activities that you can do while you are here, including a birdwatching tour, hiking through the rainforest, learning about chocolate and cacao farming, and walking through the forest via suspension bridges. The Sarapiqui River is also famous for its white-water rapids. The Tortuguero National Park is a remote utopia on the northern Caribbean coast of Costa Rica. You can get there only by boat or small plane. Fortunately, Sansa flies direct from San Jose to Tortuguero. This part of Costa Rica is famous for its rich biodiversity and pristine rainforests, and for the turtles that nest here. All four types of sea turtles in Costa Rica choose to nest on the beaches of Tortuguero. There are plenty of tours and activities to keep you busy over the weekend in Tortuguero, including a guided hike, a boat tour down the canals, kayaking, fishing, a banana plantation tour, and a birdwatching tour.